It's time to start thinking about summertime and outdoor entertaining, so we've rounded up some of our most popular grills and asked a few of our Snyder Diamond specialists to weigh in on their favorites, too. Lynx outdoor products have been expertly designed by highly trained craftsmen for over 35 years. Their grills and outdoor kitchen accessories are manufactured with commercial-grade quality and would not be out of place in the finest gourmet restaurants. As seen in the image above, they also offer a full range of cooking accessories as well as refrigeration systems. Kalamazoo is renowned for making the best luxury, high-performance grills in the world. The Kalamazoo Hybrid Fire Grill is a seriously powerful, professional-grade gas grill that also cooks with charcoal and wood. Changing fuels is as easy as opening a drawer. They also recently introduced their stainless steel smoker cabinet, a revolutionary design, hand-built in Michigan. 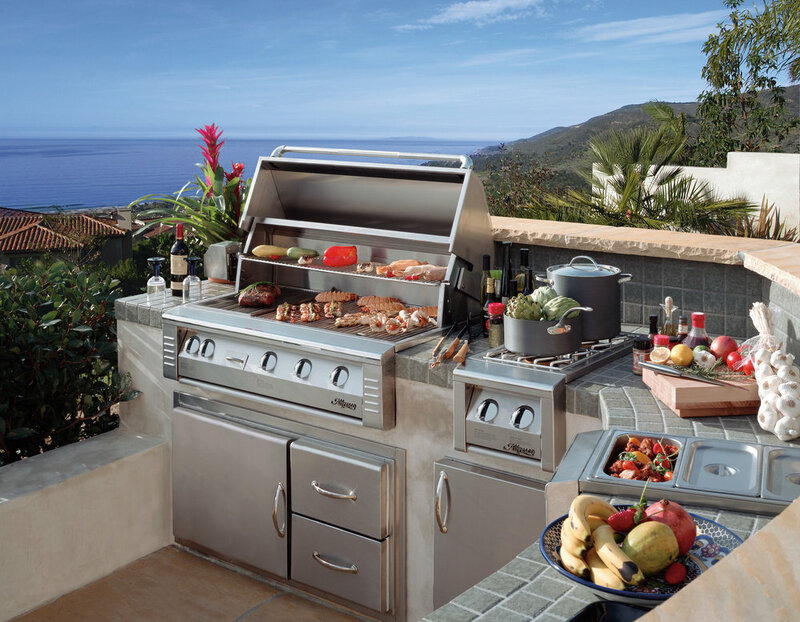 Built in Anaheim and designed in collaboration with Chef Thomas Keller, Hestan Outdoor’s award-winning grill is as handsome as it is hardworking. Available in freestanding or built-in models, it comes in 48-, 54- and 60-inch widths. 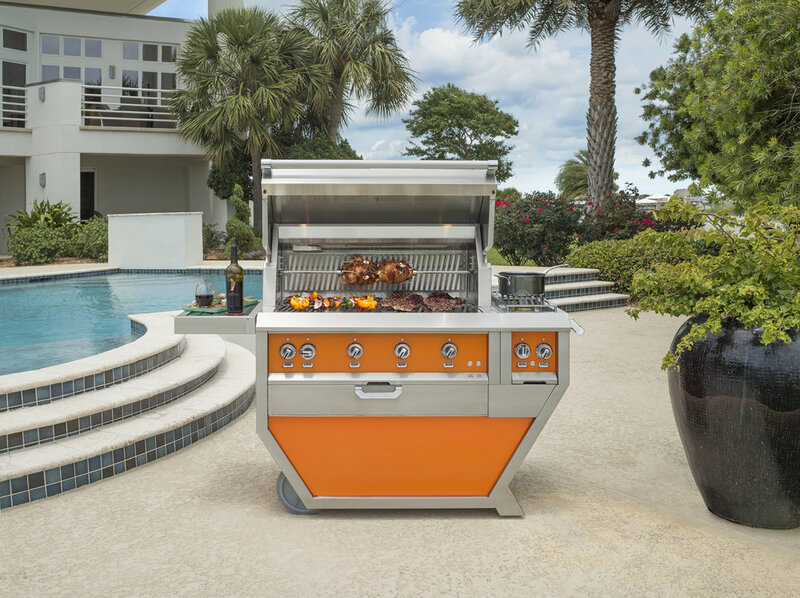 Do your outdoor entertaining on a grill that celebrates the social pleasures of cooking and dining with Caliber's walk-around grill . 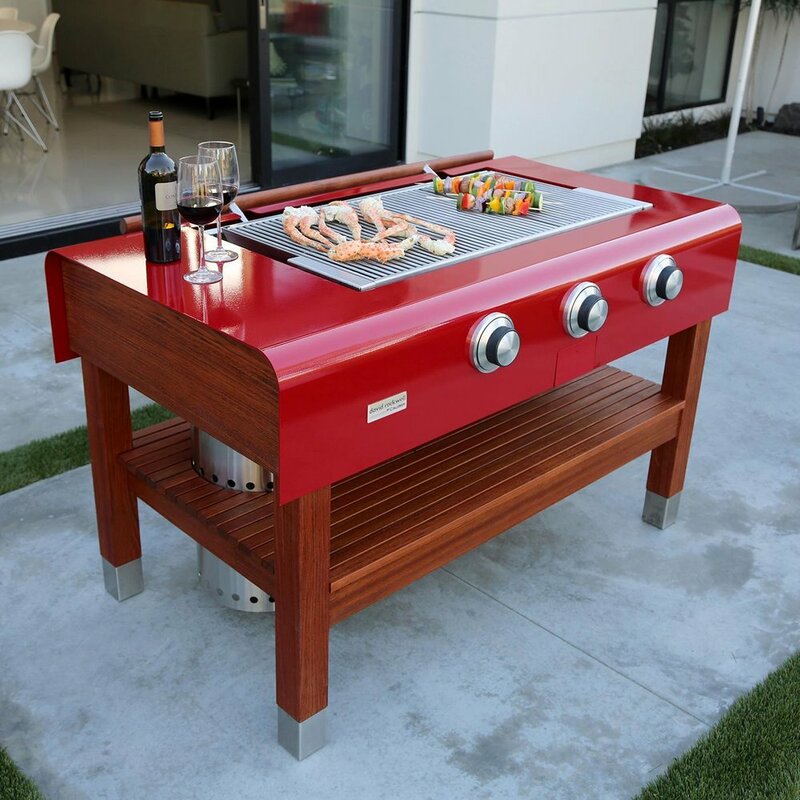 The design is a collaboration with the legendary Rockwell Design Group and features an exclusive 20,000 BTU patent-pending Crossflame burner and a powder-coated finish in red, black, or turquoise. Southern California-based Alfresco continues its legacy of commercial restaurant-quality product innovation with their new ALXE series. Alfresco grills achieve intense, even heat for perfect caramelizing results, and with ALXE, you can find just your size, thanks to models that range from 30- to 50-inches wide. Wolf barbecue grills, above and below, offer the same precision, control and ease of use as their indoor counterparts, Wolf ranges, ovens and cooktops. Their gas grills use two types of heat, direct and radiant, to achieve the ideal temperature range and uniform heat distribution that are key to flawless grilling. Visit Snyder Diamond to learn more.